In the City’s ongoing quest towards preserving open space in Horse Gulch, it will be closing on three Fort Lewis College Board of Trustees properties totaling 366 acres in September, a Durango official said at a meeting Monday. At a Natural Lands Preservation and Advisory Board Meeting, Durango’s Parks, Open Space and Trails Development Manager Kevin Hall announced the purchase while referencing a map, explaining how the board is focusing on open space purchases where property owners are ready to help the city meet their goals. The City plans to close on the FLC Board of Trustees properties outlined in yellow in September. 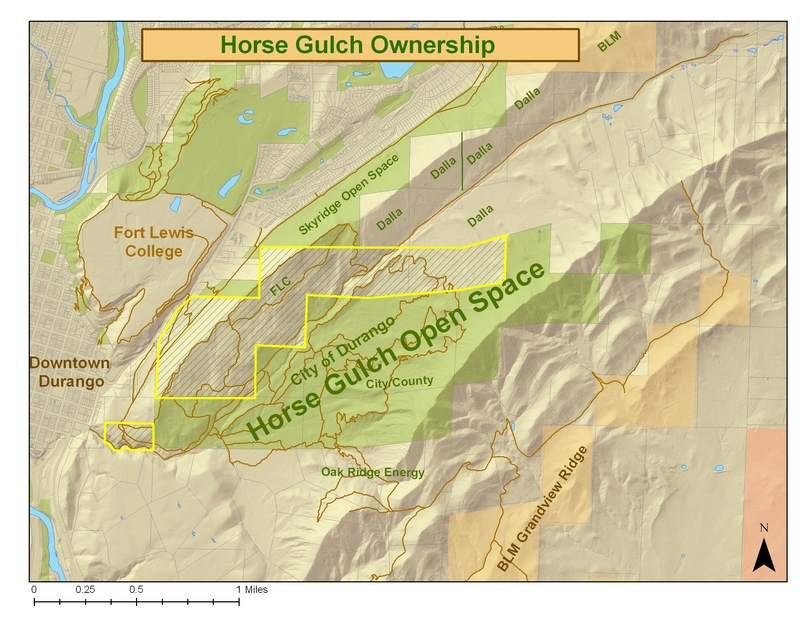 For certain Horse Gulch landowners the time for bargaining is on hold, and for the City it’s become a figurative chess game of waiting for those who own property on the south side of the gulch: Oakridge Energy. As owners of a large portion of the meadow extending south from the Meadow Loop, Oakridge Energy holds in their hands the outcome of this game of land preservation. The 35-acre parcel in the meadow is currently slated to be sold for development as part of a 1,900 acre tract of 35-acre parcels extending across Ewing Mesa and up onto the higher-reaching ridgelines of the Fruitland Outcrop. Yet Oakridge Energy isn’t ready to sell or trade off any of its assets in piece to the city. This blogger attended the meeting with the Board, hailing their open space acquisition accomplishments, while advocating for a strategic approach towards acquiring Oakridge Energy’s parcel that the Telegraph Trail and Anasazi Descent crossover below Telegraph Pass. Board member Ed Zink confirmed my message at the meeting. “You’re glad of what happened, you just want more of it?” Zink asked, bringing laughter from the Board. Purchasing property outright as open space, however, isn’t always the best option for preserving lands that the public values, said Hall. The Nataral Lands Preservation Advisory Board has been consistently supportive of preserving some or portions of the meadow extending south from the meadow loop, Hall said. The Council supports that in their plan as well, he said. Oakridge Energy’s parcel in the meadow is one of their 54 interconnecting 35-acre parcels that they’ll want to have city infrastructure extended to in order to increase the marketability of their property altogether in the future, said Board Member Mark Smith. Paul Wilbert, the Board’s Chairman, agreed, saying that several examples in Durango demonstrate the value of waiting for the annexation process to begin before bargaining with property owners who they want to see dedicating property towards open space. The Boards’s Vice Chair, Connie Imig, supported Hall’s decision to be patient with Oakridge Energy in order to have more leverage towards preserving the solitude of the open space in Horse Gulch. In closing, Hall reiterated the importance of remaining flexible with their tactics in preserving open space for Durango in Horse Gulch altogether.